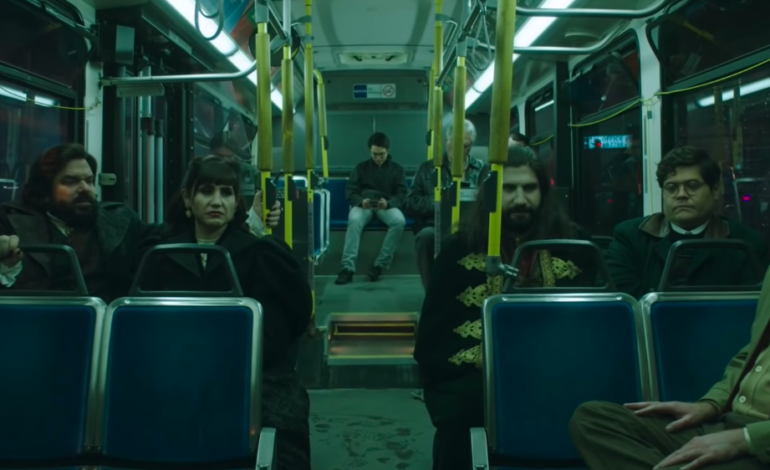 FX has released two teasers for its upcoming comedy series, What We Do in the Shadows. The series is based on the film by the same name, in which a group of vampires live together as odd roommates. Whereas the film was set in Wellington, New Zealand, the series will take place in Staten Island. Both film and series follow a mockumentary style, with the vampires giving their uninhibited perspectives on life amongst the living. The members are comprised of group leader Nandor The Relentless (played by Kayvan Novak), British foppish vampire Laszlo (played by Matt Berry), seductress Nadja (played by Natasia Demetriou), and day-walker energy vampire Colin Robinson (played by Mark Proksch). In the first teaser, entitled “Love Teaser,” characters Laszlo and Nadja describe their first meeting and how they fell in love. In much the same style as the original film, the teaser shows the vampire in an interview-like setting, talking directly to the camera, while also cutting to scenes they are describing in comedic fashion. Jemaine Clement created both the film and series, and Taika Waititi co-created the original film. Both Clement and Waititi also starred in the original film. Clement, Waititi and Paul Simms serve as executive producers. The show will premiere Wednesday, March 27 at 10pm ET.